Get Rid of Negative People. How to Start Saying No. *This post contains affiliate links. Although I may make a commission, not all recommendations are my own. Surrounding yourself with negative people can have a profound impact on your mental state of mind as well as your physical health. If you fail to avoid contact with people who are constantly negative your body can respond in physical ways like you would to an illness. On top of the energies given off by a negative person, being surrounded by hurtful and harmful words have proven their own negative side effects. If you haven’t seen the video of the two plants put side by side in glass boxes, it’s one you might want to view. Two plants are put side by side in sound proof boxes. One plant has a continuous recording of negative words being said and the other has positive words and compliments playing. I’ll let you decide which plan you think wilted faster. Don’t be that wilting flower. The thing most of us do is try to help these negative people. We often try to encourage them or raise their spirits ourselves. This is most often a losing battle. At the end of the day, we cannot control the actions of other people. The quicker that lesson is learned in life, the more success you will have. While we may not be able to change how negative people behave, we can try to understand where they are coming from. Just like the bully on the playground, negative people are often fighting their own inner battles. They hate themselves. Their negativity stems from a deep self-consciousness. Keep this in mind, but don’t let it excuse their actions. 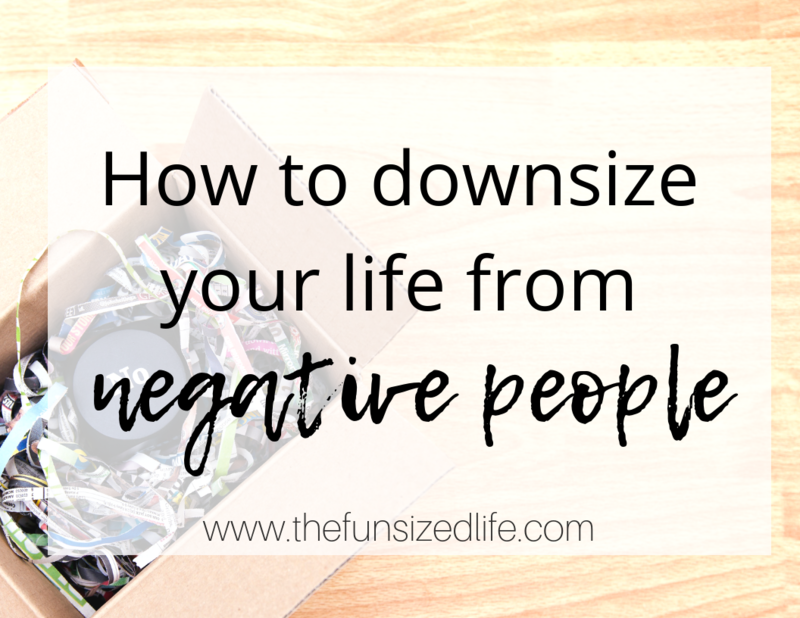 Although people are to be valued far more, downsizing negative people from your life is very similar to downsizing items. Because we as people can attach to items, the letting go process ends up being the same in many ways. Why are you hanging onto this person? Why is this a relationship that we are clinging to? Perhaps it is a friend from the past who has been there for us through some of our biggest life struggles. Maybe it’s a co-worker who we see every day and therefore can’t really “get rid of.” Hardest of all, maybe it’s a family member who is dragging you down. Someone that you love and care about very much. I have clung to relationships before because I felt like they should be different. There was a part of me that felt entitled to a better relationship with someone. Of course there have been negative people I’ve clung to because I loved them so much I thought I could love them enough for the both of us. I couldn’t. It’s not possible. The first step in the letting go process is realizing why you are struggling to let go in the first place. What new things can you gain from letting go? You know what they say. Whenever you say “no” to something, you are saying “yes” to something else. In the same sense, whenever you say, “no more” to a certain relationship you are saying, “YES” to some new reward. If a particular person drags you down every morning on your commute to work, saying no to that relationship would mean saying yes to listening to the radio, your favorite music or a positive, uplifting podcast. Saying “no” to allowing someone to cut you down of course opens you up to the freedom of positive thoughts and affirmations. No matter what there will be a benefit to saying “no” to a negative relationship. The best and healthiest thing you can do when decluttering negative people from your life is to love them first and send them off with love in your heart. Ending anything with screaming or harmful words is not healthy for either parties. That’s why it’s important to understand where their negativity is coming from and also know that you don’t need to be a part of it. Saying “no” to a relationship doesn’t mean you have to stop loving a person. If anything, there should be more love involved. Making restrictions to a negative relationship should come from a place of love for that person as well as for yourself. Once you have established why you are hanging on, what you can gain from letting go, and also understand where this person is coming from, you can start to set healthy ground rules. Limiting texts or phone calls is a good start. No longer joining your co-worker for Happy Hour or even only seeing family on Christmas are some great, healthy starts. In my post 365 Ways to Live a Better Life in 365 Days. I also touch on the importance of decluttering negative people from your Facebook, Instagram or other social networks. If that is a particular area where you struggle, the solution is as simple as a click of a button. In other cases it may take a little more effort. Sharing your thoughts with a person can take a lot of stress off of you. Being able to finally speak how you feel about their behavior can be life changing. For you. Chances are, this person is so set in their ways, they won’t make any lasting changes based on your feelings. Be ok with that. Unlike stuff, you don’t have to toss out a relationship completely. You just need some healthy ground rules to live by. Doing this can lower your stress level and take any guess work out of the relationship. Maybe you’ll need to discuss these ground rules with them, maybe it’s something you can implement on your own. Whatever the case, it is important to follow through. Negative people will see any second guessing as their way to sneak back into the areas of your life that you don’t want them to be a part of. That is why it is so important to follow through with whatever ground rules you have set. Remind yourself that this is for the love of the other person as well as yourself. I remember holding on to a negative friendship and feeling like a dark cloud was above my head every time she called. After 4 years I finally cut off all forms of communication and it was an instant relief! I believe that your thoughts play such a huge role in how you see yourself and the world so I try to cling to good energy. So glad you were able to let go. It is no easy thing when it’s been such a long, constant thing!